OK people, before we get off on the wrong foot here, let’s make one thing clear: I love real Christmas trees. I truly enjoy having a real pine tree in the house as winter begins and snowflakes gently float past the windows like gossamer angel feathers, nestling upon the sleeping earth and gathering into soft little pillows upon which winter faeries can dream their frosty holiday dreams. The whole house smells of pinewood, and it helps you to believe in the possibility of a strong, healthy new year. I love the ancient traditions to which they connect us, reaching their prickly boughs back through the ages, well beyond Christmas itself. With a fresh Christmas tree in the house, everything just feels OK.
That said, real Christmas trees can be a real batch of prickliness. Raise your sticky, crud-crusted hand if you hate pine pitch. Christmas trees are positively oozing with that crap. Now, one might assume that pine pitch (or pine “sap” for our city-born friends) is somehow necessary for the tree’s growth and survival. But, alas! As I’ve learned from years of gripping the gluey trunks of freshly cut pine trees, pitch’s God-given duty in the natural order of things is to drive me bat-crappin’ insane. Inevitably, I get pine pitch everywhere, from my fingers to my hair to my coat to my pants to my doorknobs to my hand towels to my houseplants to my children. Inevitably, I get pine pitch everywhere, from my fingers to my hair to my coat to my pants to my doorknobs to my hand towels to my houseplants to my children. I’m pretty sure you could X-ray me every year on Christmas Eve and see that I’ve somehow absorbed a solid quart of the stuff. And once that junk is stuck onto something, it almost immediately picks up dirt. So as a bonus, it not only feels dirty, it looks dirty, too. My only feasible recourse is to shred up some newspapers and stick the pieces onto every splotch of pitch I can find in the hopes of curbing the goo-spread. Sure, it eventually dries up like crusty boogers so you can scrape it off and finally get on with your life, but that takes time – precious holiday time. Hold up. I’m getting ahead of myself. First you need to figure out how to actually get your mostly dead tree into your home. Personally, my favorite point of attack is the front door. At my house, once you go through the front door, you need to take an immediate left, or you end up in a closet which isn’t much fun at all unless you’re looking for the vacuum cleaner. This isn’t a very difficult path to navigate – unless you happen to be heaving an awkward, sticky conifer. The angles pretty much guarantee you’ll be scrapping the tree along a door jam and under an archway, shearing off an absolutely obscene amount of pine needles. Unfortunately for me, this is still the most direct route to where we display our holly jolly holiday icon. 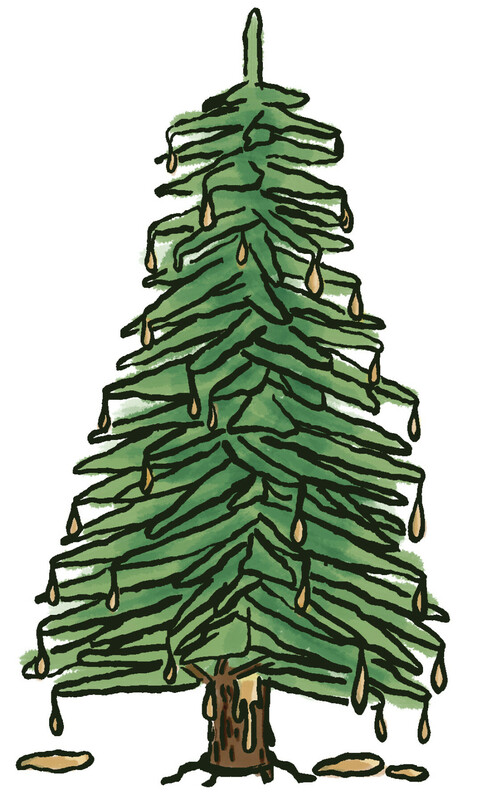 If you’ve never struggled to get a pine tree into the indoors (because this is the first Christmas you’ve celebrated at your own place, or you just recently converted to a Christmas-centric lifestyle) trust me – shove your tree through the door bottom side first. It’s easier. But also remember that once you get the first few branches past the threshold, there’s no turning back. If, for some godforsaken reason, you try to pull it back out, the bottom row of branches will spring out like Santa’s massive pine-scented grappling hook, digging into the doorway, making it nearly impossible to remove. And if you try yanking on the trunk, its natural defenses kick in, causing the sinewy boughs to secrete gallons of the aforementioned sap, essentially super gluing your giant green grappler firmly in place. This means you can’t close your front door for the rest of winter and your family will probably freeze to death. However, once the fighting and the shouting and the man-on-tree violence is over, you’ve got a pretty great holiday decoration that’s totally worth the trouble. Until you attempt to pop it into one of those stupid red and green metal tree stands with four useless thumbscrews. But that’s a horrific holiday story for a different winter’s day.